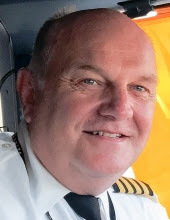 News has just reached our group with the passing of active Delta pilot Captain Philip ‘Phil’ Henry McBride, age 56. Following his military career, Captain McBride joined Delta Air Lines 11-18-1997 and was based Atlanta. Captain McBride is survived by his wife Anne, their children and grandchildren, plus many other family members and friends. Services for Capt. McBride were held last Saturday August 19th in Peachtree City, Georgia. 337 Legacy Lane, Peachtree City GA 30269-3641 ... (770) 486-4912. ...........a celebration of his life and really done well, including an AF flag folding detail and 3 volley salute with taps.